Said Hammami was born in Jaffa in 1941. His father, Adil, was a member of the city council and of the Istiqlaal (Independence) Party. In 1948, when war broke out, many Palestinian supporters of the Hashemite family fled eastward to Jordan, while backers of the mufti of Jerusalem, who was then in an alliance with the Egyptian regime, tended to go south, towards Gaza. The Hammamis, however, decided to stay in Jaffa. But the Haganah (the Israeli armed forces) soon began deporting Arabs from the city. The Hammami family ‒ mother, father, five daughters, and seven sons ‒ were placed on a lorry, along with what possessions they could muster, and driven south. At a crossroads, they were ordered off the lorry and directed toward Gaza. Their possessions remained behind. Said Hammami spent the early years of his exile in Gaza [according to his daughter Rasha, the family went to Port Said for a while, then lived in a camp in Lebanon, before ending up in Jordan two or so years later], but later managed to make his way to Lebanon, where he became active in the Palestinian resistance movement. In the early 1970s, he became the official representative in London of the Palestine Liberation Organization (PLO). 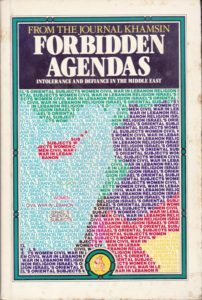 Hammami took a keen interest in the political groupings in Britain, and in particular in those that concerned themselves with the Middle East and the Arab-Israeli conflict. He became aware of the activities of a group of anti-Zionist Israelis living in Britain and several other European countries, as they participated in a number of movements together. Some personal contacts were established. 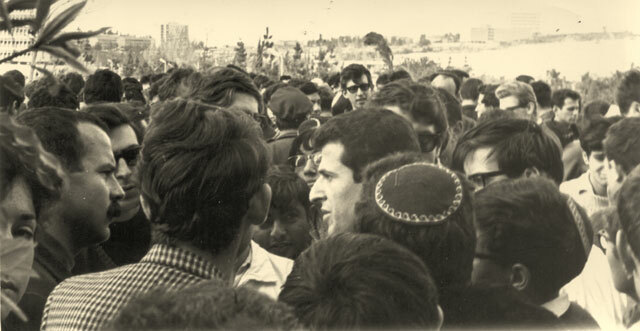 After the October war of 1973, an intense factional struggle erupted within the Palestinian movement over the prospects of what came to be called “the peaceful solution”. Discussion of closely related matters arose alongside this debate. What is the nature of the Israeli Jewish population? Do they constitute a collection of coreligionists, an ethnic group, a nationality? What rights should they have, if any, in a “liberated” Palestine? Could anti-Zionist Israeli Jews play any part in the fight against Zionism? Was any cooperation between Israeli Jews and Palestinian Arabs possible, and if so, on what basis? 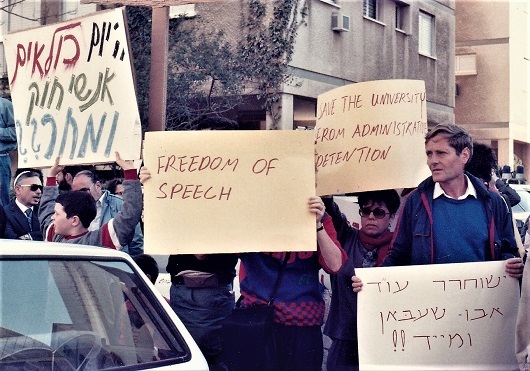 In 1975, the Socialist Organization in Israel, publishers of the journal Matzpen, approached Said Hammami with the proposal that he grant them an interview dealing with some of these questions, to be published in Hebrew in Israel. The interviewer would be Moshe Machover, a member of Matzpen, a founder of Khamsin and member of its editorial group, and one of Israel’s most active anti- Zionists abroad, who had established friendly personal relations with Hammami in London. Hammami agreed to this request; subsequently, at his suggestion, the interview was transformed into a dialogue, with a more active participation by Machover. The final text of this dialogue was translated into Hebrew and published by Matzpen in Israel, where it achieved some notoriety. It was also published, in a French translation, in Khamsin 3, under the title “Vivre Ensemble“. There had, of course, been previous written exchanges of views between Palestinian organizations and Israelis ‒ but these were conducted at long range, so to speak, the participants merely writing articles discussing one another’s positions. On the other hand, there had been informal, personal contacts between Israelis and Arabs. But this was the first time that an official representative of the Palestinian movement had agreed, in his official capacity, to engage in a face-to-face exchange of views with an Israeli in a format designed from the outset to produce a discussion intended for publication ‒ and publication in Israel at that. For that reason alone, the dialogue is of historical interest. But its sequel lends it a special poignancy. Whatever may be said about Hammami’s political views on particular points, with which one may agree or not, there is no denying the non-sectarianism of his attitude to the Israeli Jewish population: he recognizes that they constitute a nationality just as much as the Palestinian Arabs, and that they, too, are entitled to national right in Palestine. To hear a Palestinian spokesman say this was not necessarily congenial to fanatics on both sides. To the Zionist leaders, Said Hammami was just another “terrorist”, an epithet they freely apply to any Arab who fails to grasp the majesty of the Zionist endeavour. To chauvinists in the Arab camp, he was a traitor simply because he saw the Israelis as a people too, and considered some of them potential partners in a struggle against injustice. In February 1978, Said Hammami was murdered in London. The assassins were never captured, and no organization claimed responsibility for the act. But it was widely assumed at the time that those responsible were members of the Palestinian group led by Abu Nidal, which had split away from the PLO. Although the conjunctural situation has changed since this dialogue took place, the deeper issues raised in it are as pressing as ever. In that sense, it has lost none of its significance. Moshé Machover: If you don’t mind, Said, I’ll start with questions about the long-term aim of the PLO, the unitary democratic secular state. The first question is very simple. In Yasser Arafat’s speech in the UN, and in your article about Palestinian strategy, you say that the Jews now living in Israel are welcome to stay, provided they live together as equals with the Palestinian Arabs. On the other hand, there is that well-known paragraph 6 of the Palestinian Covenant. How do these things square with each other? Said Hammami: You are right in saying that it is a long-term solution; it cannot be anything but a long-term solution; it cannot happen tomorrow. In paragraph 6 we say that all Jews who were living in Palestine before the Zionist aggression are Palestinians. When did Zionist aggression start? This is not said in the Covenant. If we consider that Zionist aggression started in 1917, then it is true that Jews who were living in Palestine then are Palestinians. Even if we consider that Zionist aggression started in 1947, then again, it is true that Jews then living in Palestine were Palestinians. There was then no state of Israel. The Covenant was drawn up in 1964 and it was then considered a major step forward in the Palestinians’ understanding of the Jewish community in Palestine, in the Middle East, in Israel. Before 1948, the reactionary leadership ‒ the mufti and the rest ‒ considered that only those Jews who had always lived in Palestine (in old Jerusalem, some in Tiberias, and so on) were Palestinians. The rest had no right to be there and they had to go back. In 1964, Shuqairi and the Covenant said that all Jews who came before the aggression are Palestinians. It was a step forward because the Covenant didn’t speak of the Jews as a religious group opposing us as a religious group. It was no longer a question of holy war. The Covenant was the only authorized Palestinian charter until 1970. 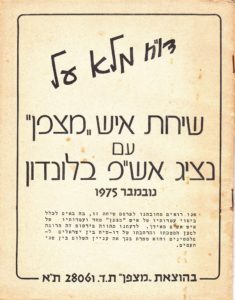 In 1970, in the political programme, the Palestine National Council decided that all Jews living in Israel could be citizens of the democratic state for which we struggle. Moshé. So the formulation of the 1970 programme supersedes that of Paragraph 6 of the Covenant? M. In your article about Palestinian strategy and also in some other recent articles by people of the PLO, you talk about the Israeli Jews as a people, not as a religious group. In the past, Palestinian spokespeople have always called the Israeli Jews a religious community. This is implicit, for example, in the formula ‘democratic secular state in which Muslims, Jews, and Christians can live together’. This often-repeated formula refers to the ‘Jews’ exactly as it does to the ‘Christians’ and ‘Muslims’, in other words, as a religious community. From our point of view, this is a mistake. First of all, the majority of Israeli Jews are not religious and consider themselves not as part of a religious group but as part of a national group. Second, from an objective point of view as well, the Jewish community in Israel possesses a national character, since it has all the usual national characteristics, in particular a language of its own. We reject, of course, the Zionist claim that all the Jews of the world constitute a people. But we do think that the Jews of Israel surely constitute a nationality. It is true that this nationality was artificially created through the Zionist colonization and that this process occurred at the expense of the Palestinian Arab people. But just as a hill created by a bulldozer rather than by natural processes is none the less a hill, so a people created artificially is none the less a people, and this fact cannot be ignored. The question then becomes, How will the national character of the Israeli Jewish people find expression, and what will its status be, in the unitary democratic state? There is also another side to this question, concerning the Palestinian Arabs: they have a national character of their own too; they are a people. How do you envisage the way in which these two national entities will find expression in a common unitary state? S. Well, as you said, I believe, and all progressive Palestinians believe, that the Israeli Jews now living in Palestine constitute a people, a new people, a people that has been created in the fifty years of conflict, but specifically from the mid-forties or so. There is an Israeli working class, there are Israeli progressive organizations. Now, the fact is that there are two peoples: the Palestinian Arab people and the Israeli Jewish people. These two peoples have a just claim to Palestine. I believe that we belong to Palestine, that the country is ours. I also believe that every genuine Israeli Jew, especially those who were born there and have lived there for years and years, believe that they come from this country, that it is their country. I don’t blame them for what Herut have done. I don’t blame them for what the Zionist reactionary and terrorist organizations did to my country. I don’t even blame the present Israeli generation for what their fathers did to me personally, expelling m from my country. But they should also know that we exist as a people and have a just claim to that country. Not a single progressive Palestinian can say to an Israeli Jew, ‘You don’t have a right to this country’. But not a single Israeli Jew can say to a Palestinian Arab, ‘I have more right to this country than you’. We probably have a bit more right to Palestine than the Israeli Jews. The fact is that we both exist as peoples. The question is: ls conflict the only relation possible between these two peoples? My reply is: Definitely not. This conflict started as a result of the policies and ambitions of the agents of imperialism. On both sides. The reactionary Zionists and reactionary Arabs. The question is now how to bring peace between these two sides, the Palestinian Arab and the Israeli Jews. They both believe that they belong to one country, so the simple answer is, let them both live in it. How can two peoples with different languages and cultures live together? In a secular state, in a democratic state, in a non-sectarian state, or perhaps in a binational state. But they both must live in the same country. Probably as a first step ‒ and I believe that it is a necessary step, an inevitable step, whether we or they like it or not ‒ Palestine should be partitioned between the two peoples. I say as a first step, and only as a first step, because it is ridiculous to think of such a tiny area divided permanently into two states. You stand at the mountain of al-Salt and you can see the whole country from Baisan to Wadi ‘Araba. You can motor from this side of Palestine to the other in half a day. Apart from the Negev desert, Palestine is a very small country. In the long run, it cannot be divided into two viable independent states. But for the sake of peace between the two peoples, there must be two states as a first step, and from that first step I think the solution will be in the hands of the progressive forces on the two sides. M. But supposing now that we have managed to unify these two states ‒ I’m talking now about the future. How would the distinct national characters of these two peoples find expression within this unified and common state? I ask this question because the formula repeated so often by PLO spokesmen ‒ ‘a democratic secular state in which Muslims, Christians, and Jews can live together’ ‒ has been rejected by many Israelis who have the best intentions. They would say, more or less: ‘The Palestinian Arabs are waging a war of national liberation, and consider themselves as constituting a national community. But on the other hand, they speak of us as only a religious community. It thus seems that they deny the national existence of the Israeli Jews and do not intend to permit this existence in the future’. Recently, you have explicitly spoken of the Israeli Jews as a people. I would like to ask you, Said, whether within this future unified state that you envisage, there will remain national institutions through which the distinct national cultures, different languages, and so on will be expressed? S. Yes. It is in our political programme. There will be freedom of expression, freedom of faith, there won’t be any racial discrimination, no national discrimination, and all people will have the right to form their own political and national organizations. I remember in 1971, during the discussion of this first paragraph of our political programme, there was a two-day-long argument about the word ‘national’. Do we accept that the Israeli Jews are a nation and have the right to establish their own national organization in the future Palestine? We did accept this. You remember, you and I used to discuss this point, and I used to ask you how an anti-Zionist would define the people now living in Israel. I remember you once used the expression ‘Hebrew-speaking community’. And in fact I used this term for some time. Through our continuing discussion of this point, you and I can now call that community the Israeli Jewish people. As I have said, the Palestinian programme has accepted the idea that within the future unified Palestine, the Israeli Jews will have the right to their own national organization. They have the right to keep their language, their traditions, their faith, their culture. Once we agree that it must be a democratic state, it must be a real democracy, not the kind of so-called democracy that gives privileges to some people while others are under-privileged. M. And of course, on the other hand, one cannot require from the Palestinian Arabs that they sever their contacts and connections with the rest of the Arab world. M. I think that the right to form separate trade unions for each nationality ought to be excluded from that list. Trade unions are, or anyway should be, class organizations, and should be organized on a supra-national basis. You mention the Kurds. Their unhappy existence is often used to show that it is impossible for different peoples to live together. Here are the Kurds in Iraq, and they are being suppressed, and their right to self-determination is not respected. Also, more recently, the events in Lebanon are used by a lot of Zionists to show that living together in a pluralist society does not work. M. But it was a state composed of different communities having some arrangement to live together. And it does not seem to work. S. Yes, It did not work for two reasons. First because it was not secular, and second because it was not socialist. It could not be a secular state when the president must be a Maronite, the prime minister must be a Sunni Muslim, the leader of the Parliament must be a Shi’i Muslim, the commander of the army must be a Maronite, the chief of staff must be a Druze. This is not a secular state. I think the roots of the latest bloodshed lie in the National Pact of Lebanon, in the so-called gentlemen’s agreement between the heads of the religious groups. These people were not really religious; it was only class interest. This leads to the second point. It was not a socialist state. What Lebanon has seen lately was inevitable. In a society like this, where the rich got very much richer, especially in the past five years, and the poor got very much poorer, also especially in the past five years, it was very much to be expected. But to say that it was a conflict between Christians and Muslims and Druze is not true. The leader of the Phalangists, the right-wing Maronite Kata’ib, is Pierre Gemayel, and he is a Maronite. All right. But the vice-chairman, Kazem Khalil, is a Shi’i Muslim from the south, from Tyre. The leader of the left-wing, so-called Muslim alliance, is not a Muslim. He is a Druze, Kemal Jumblatt. Another leader of this alliance, Nicola Shaawi, is a Christian, and a third, George Hawi, is a Communist. To say that it is Muslims against Christians is as wrong as it is misleading. From the papers you might think it is between Christians and Muslims, but if you lived there for just five weeks, you would say, ‘My god, there must be a civil war one day in this country’. If you see all these great buildings, the shopping areas in Beirut, all the luxury of the West, and then you drive for just five minutes, and you see the slums ‒ and these are Lebanese people! In Lebanon, the number of proper Lebanese people living in camps is double the number of Palestinian refugees living in camps. M. Let us now take up a problem relating to the short term. I want to ask you about the demand of the PLO to establish an independent Palestinian authority in the areas from which Israel is compelled to withdraw. Since this is a transitional stage towards the establishment of a unitary state in Palestine, and since, as you say in your document, you hope that the future stage can be achieved by peaceful means, how do you estimate the reality of this demand now, two years after the October war? How realistic do you estimate it to be? It is known that the USSR supports this demand. What about the Americans? Do they support it? Do you know of any steps they have made to indicate support for such a settlement? S. This should be known very well. When we demand the establishment of a Palestinian state in the West Bank and Gaza, those parts of Palestine from which Israel should withdraw, it is not a conciliatory step, it is a realistic step. Whether there is a peaceful settlement or not, there is a fact we should be aware of: that there is an Israeli Jewish people, and there is a fact they should be aware of: that there is a Palestinian Arab people. And in order to bring these two peoples together to live in one state, there must be, as a first step, two states. The Russians did not support this in the beginning. Now we are very happy to see that the USSR understands us better, and lately Pravda has written that they believe that the legitimate rights of the people of Palestine are the central issue of the conflict, and that there won’t be peace in the Middle East so long as there is Zionism. This is a very big change in the USSR. So far, the Americans say that they will not talk to the Palestinians if the Palestinians do not recognize the state of Israel as an independent state and guarantee its future security, integrity, and independence. We never tried to contact the Americans. They tried to contact us indirectly and they wanted some private secret talks. We said no. If you want to talk to us, you talk to us openly. If we do something, we are not ashamed of it, so why do it secretly? No secret talks, no secret deals! And so long as we continue to struggle, I believe that there will come a day, probably soon, when the Americans realize that if they, for their own reasons, want to avoid war, then they will have to speak to us. I can see this day coming. M. Everyone knows that there are factions within the Palestinian movement, known by the name ‘Rejection Front’, that oppose this demand for a Palestinian state on any territories that Israel is forced to evacuate. George Habash’s Popular Front is part of that faction, as is the group of Ahmed Jibril. On our side of the border as well, some people echo the same rejection. Abroad, some far-left Israelis, as individuals not really representing any group, are opposed to the principle of self-determination in any event ‒ not only in the case of the Israeli Jews or the Palestinian Arabs, but for any people. Also in Israel, there is a Trotskyist group, which split from Matzpen about four years ago and became the Israeli branch of the Trotskyist Fourth International. (This group is sometimes confused with Matzpen, because they sometimes use the same name, although their political line is different.) These Trotskyists, although they accept the principle of self-determination in general, oppose this immediate demand for a Palestinian state. These advocates of the ‘Rejection Front’ sometimes claim that the creation of a Palestinian state in any territories Israel is forced to evacuate is no more than one element of an entire arrangement for pax americana, an objective of American imperialism in the Middle East. What is more, in their eyes, this demand for a Palestinian state has no meaning outside the context of an imperialist settlement. In raising the demand for such a state, they therefore argue, the PLO is making itself an accomplice of American imperialism. Arguments like this have been made on both sides of the border. What have you got to say to this? S. Some of those who say this are American agents who want to sell this idea to the people: that nothing can ever happen without an American OK. So that if a Palestinian state comes into existence, it would be just because the Americans approve it. If there is no state, it is because the Americans don’t want it. The idea is that the Americans are like God. If they withdraw from South-East Asia, it is because they had a deal with Russia. This would mean that peoples should go to sleep and do nothing; it is the super-powers who do everything. It is very dangerous, and I always suspect those who preach this idea. The other sort of people who talk this way are anarchists or ignorant people who don’t know what a people’s struggle is. Anyone going to the Middle East, to any Palestinian refugee camp, in Lebanon, seeing the people, how they train, how they behave, their morale, and tries to remember how things were, say, ten years ago, can realize the change. This change took place as the result of a long and bloody struggle. If you and I can see this, the Americans can see it. If our demand to establish a Palestinian state is ever fulfilled ‒ and I hope it will be, soon ‒ it will be the result of the bloody struggle of the Palestinian people. To those who say that this will be just a part of pax americana, I say this: imperialism, especially American imperialism, has never given a people a homeland or anything good. I know of imperialism giving people napalm, death, destroyed cities, destroyed countries, bloodshed. But they don’t give them states. If American imperialism is to become a charity organization giving the Palestinians a state and giving the South-East Asian people independence, then we will have to change our mind about imperialism. To put it briefly, those who believe that if the Palestinians liberate any part of their country and establish an independent state on it, then it will be part of an American deal, those people should go and see the Palestinian fighters who have been fighting for it for ten years. If this does not convince them, then nothing will. M. I also believe ‒ and I think that this is the opinion of the majority of the comrades of Matzpen ‒ that there is no chance of the Americans offering the Palestinian people the slightest independent state on a silver platter, so to speak. The reason flows from the nature of relations between the United States and Israel, and from the fact that the Zionist leadership is opposed in principle to the creation of a Palestinian state. Today, since the October war of 1973, Israel is no longer the exclusive ally of the United States in this part of the world; but it is still the closest and most reliable of Washington’s allies. The United States now also has allies among the Arab states. But the relations between the United States and the Arab countries have always been based on exploitation, and that is still the case. Therefore, even if the regime of a given Arab state is at present prepared to collaborate with the United States, there will always exist in this country significant social and historical forces that threaten to shift state policy in an anti-imperialist direction. For Israel, the situation is different. This state is not economically exploited, but subsidized by imperialism. Hence, so long as imperialism remains dominant in the region and is in a position to control Israel, this country will remain a sure ally. The Americans are prepared to exert pressure on the Israeli government and to impose concessions on it here and there, but I think that this pressure will not be so great as to compel the Zionist leadership of Israel to make concessions on what is, for it, a question of principle. I therefore think that opposition to the creation of any independent Palestinian state is a question of principle for the Zionist leadership. The reason for this rejection is not that they fear such a state militarily, in the short term. The problem is more fundamental. The entire legitimacy of the existence of Israel as a Zionist state has never been based on the right of self-determination of the Jews who live there, but on the so-called historic right of the Jews of the entire world to Palestine. From that starting point, to acknowledge that another people exists in Palestine who can legitimately lay claim to this country would amount to undermining the legitimacy and self-justification of Zionism. It seems to me clear that for the immense majority of the Zionist leadership ‒ whether in the government or in the right opposition ‒ this is an absolute principle. And given the importance of Israel for American interests in the region, I surmise that the United States will be in no hurry to compel Israel to make any concession on this point, on which the Zionist regime will remain intransigent. Consequently, I also conclude that a Palestinian state is not something that the Americans will hurry to offer the Palestinian people; such a state can arise only from struggle. By the sound of what you just said, I gather that this is your opinion too. S. Yes, of course, and it may be a long struggle, and certainly bloody. It is a demand: that is the correct word. We demand the establishment of a Palestinian society, a Palestinian authority, a Palestinian state on any part of Palestine that we can liberate. Once this is established, there will be a new atmosphere, a new situation, that might require a new strategy. I find that the rejectionists confuse the slogan, the demand, and the aim. Our slogan is ‘Revolution until victory!’. Our demand is the establishment of an independent Palestinian state in any part of Palestine that is liberated. And our aim is the establishment of one united, secular, non-sectarian Palestine in which all the Israeli Jews and all the Palestinian Arabs can live democratically, according to ‘one man, one vote’. We should not mix up these three things, or else we shall be misled into the realm of the Arabian Nights, of Alladin. Because of what has happened in the Middle East during the past two years, the number of people who believe that this Palestinian state will be established as a result of pax americana is becoming very small, and these days I see hardly any of them around. M. Some further questions connected with this demand for a Palestinian authority, a Palestinian state. The first is this: I can see how the establishment of such an authority will give some satisfaction to those people now living under Israeli occupation. But what about the Palestinian refugees of 1948, those living in Jordan on the East Bank, in Lebanon, and other places? How will this relate to their problem? We members of Matzpen, along with other progressive groups and organizations within Israel, struggle for the right of the Palestinian people to create its own state, as a part of its right to self-determination. But at the same time, we think that the creation of a Palestinian state in the West Bank and Gaza would directly satisfy the needs of only that part of the Palestinian people which lives in the occupied territory. In our view, for those who live outside Palestine, other demands must be added. In fact, isn’t there a danger, as some people say, that if a Palestinian authority is established, then some of the Arab governments will try to expel the Palestinians living in their countries, so that rather than helping these people, the establishment of such a state may be detrimental to them? S. Nothing could be worse than the present life of the refugees of 1948. The establishment of a Palestinian state cannot make things worse. Things will be much worse if such a state is not established. Some people say that the Arab states will expel the Palestinian refugees to this newly established state. Well, the Arab states won’t have to expel them; we will ask them all to come and live in their own country, in their own Palestine. There is something about us, the Palestinian people, that everyone should understand; it is not that I come from Jaffa or Acre or Nablus or Jerusalem. I come from Palestine. I am a Palestinian. And this state will be a part of Palestine and it is going to be called the Democratic State of Palestine. We believe in a democratic state over all of Palestine, and if we take one inch we will call it the Democratic State of Palestine, and it will be a democratic state. And as I said in my paper, I would like to see this state welcome any Jew who wants to come and live with us without discrimination. We shall have our own law of return, but it will not be a racist, reactionary law of return. It is going to be a democratic progressive law, and we want as many Palestinians as possible to come and live in their country. I can’t see any logic in the argument of those who say that the establishment of such a state will endanger the interests of the 1948 refugees. M. But what about their right to return to the other side of the border? The part that will be in Israel, within the pre-1967 borders? Ever since the formation of Matzpen, about five years before the 1967 war, we have fought for the right of the refugees of 1948 to return to their homes. We believe that this demand is equally just today, and we fight for it, while at the same time supporting the right of the Palestinian people to create an independent state. S. Yes, their right must be maintained. I believe that in principle everyone should have the right to live and work anywhere. This is in the Human and Civil Rights Charter of the United Nations. But let us take an example. In 1948, seventy thousand people were expelled from Jaffa and became refugees. I was one of them, and I was physically expelled. I remember it very well, in great detail. My father, my mother, all my family, we remember it in detail. Now, if we bring these seventy thousand people to Jaffa tomorrow, and I am one of them, I am sure that the next day there will be a civil war. We will come to a town called Jaffa that will be very new to us; we will find people living in our homes; we don’t speak their language, and they don’t speak ours. We have different cultures, and this background of violence cannot be a very good step towards coexistence. So I say, let us have a state. This would draw the poison out of the hatred. This would relax the exaggerated alarm of the Israeli Jews; this would reduce the tension among the Palestinians. And then give it time: ten, fifteen years. In ten or fifteen years, the Israeli Jews will find out what nice people we are ‒ and I really believe in this. They will realize that we are not monsters, but people like them; that there are many things that make us friendly, many things that make us happy, that there are many things that we would die for: first freedom, and we have been dying for freedom for the last ten years. We want them to know this. But what is more important than all this is that the progressive organizations among the Palestinians and the Israelis will have a much better atmosphere for struggling, for a dialogue. Today, with this alarming slogan that the ‘enemy is at the gates’, progressive Israelis cannot speak freely to progressive Palestinians, and vice versa. Not because we, the PLO, do not want to speak to progressive Israelis. But even when we want to speak to them, we have to go to Europe. We can’t go to Israel and we can’t invite them to any Arab country. If we have our own state, we can invite them to our capital, they can come and talk to us there. And this will, of course, disarm all those right-wing chauvinists in the Zionist movement in Israel, and it will also disarm or weaken the already weak position of the right-wing chauvinists among us. This is another reason why I believe that a Palestinian state must be a necessary first step. We, the PLO, know very well ‒ and this is in our documents ‒ that in all our meetings we issue greetings to all the progressive elements in Israeli society. Why can’t we invite them to our meetings? Simply because our meetings are held outside Palestinian territory. It is not our territory, we are guests there. If we had a state, it would make dialogue much easier, and it would make it easier for them to struggle against Zionism. M. I would like to mention another portion of the Palestinian people: those living in Israel within the pre-1967 borders. Some members of Matzpen are members of this community, and many Arab workers, students, and peasants in Israel read our publications. In other words, we know the problems of this community close up. We support ‒ and we have always supported ‒ their double struggle: against discrimination and the negation of their individual rights, and against the negation of their national rights as members of the Palestinian Arab people. The members of this community, about half a million strong, are Israelis in the legal sense. But from a national point of view, and in the light of their own consciousness, they are part of the Palestinian Arab people. It does not seem that the creation of a Palestinian state in the territories Israel is compelled to withdraw from would directly improve their lot. What about their right to self-determination? S. We are very much concerned with what happens to the Palestinians living in Israel, but we believe that the immediate problem facing us is not them. Their problem is a big one, but the biggest problem is that of the refugees and the people living under occupation in the West Bank and Gaza, because there is a Palestinian society that the Zionists are trying to destroy. If that society were destroyed, it would be the greatest setback to the Palestinians. I personally think that if we establish a Palestinian state on part of Palestine, we should say: Because we believe in the reunification of Palestine, anyone with Israeli citizenship can also have Palestinian citizenship. And I hope that this will be reciprocated. Of course, the Zionist authorities of Israel will say, ‘No, we want an exclusive Jewish state’. But this would be an objective and realistic demand for progressive people in Israel to raise. And without the immediate danger of war, the atmosphere for struggling for this demand will be better. The Palestinian people in Israel were once called ‘Israeli Arabs’. When we began struggling, they became Palestinian again. The Israeli authorities realized that they were no longer Israeli Arabs, but that they now define themselves as Palestinians. I think that their identification as Palestinian will become stronger when there is a Palestinian state. As I have already said, there will be a new atmosphere in the Middle East: you won’t be in danger of being called up to the army at any moment; I, living in a camp, won’t be in danger of being bombed by napalm at any moment. For the Palestinians inside Israel, this will be a major step forward for consolidating their national identity. The problem of the Palestinians in Israel is one more reason why I think that a Palestinian state is just a first step. It should be followed by further steps, to consolidate peace. It is only a first step because it is not going to solve all the problems. But ‒ and I will never tire of repeating this again and again ‒ it will create a new atmosphere of understanding. The establishment of such a state will also be a major retreat for Zionism. I, as a Palestinian, whose entity was ignored, who was never accepted as a Palestinian, I know what it would mean to the Zionist authorities to recognize the existence of the Palestinian people, and our right to have our own state in Palestine. For Zionism, to recognize us would be a great retreat. We hope that by struggle we will gain such recognition. By struggle only. To go back to what we were talking about before, about the rejectionists, they should realize what it is for a Zionist, especially members of the Israeli cabinet, to recognize us as a people, and to acknowledge our right to have a state. To many of them this would mean the end of Israel. In fact, I know that it is not going to be the end of Israel. The state of Israel will probably continue to exist for four or five decades after the establishment of a Palestinian state. But it might be the beginning of the end of Zionism. The beginning of the de-Zionization of the state of Israel. M. I now have a delicate question. You have spoken of the Israeli Jews as a national entity. You did so both in this discussion and in your article, which, I should mention, we have published in Israel, in Hebrew. Is this just your personal opinion or is it the opinion of part of the PLO, or the whole PLO? Are these things also said in Arabic? 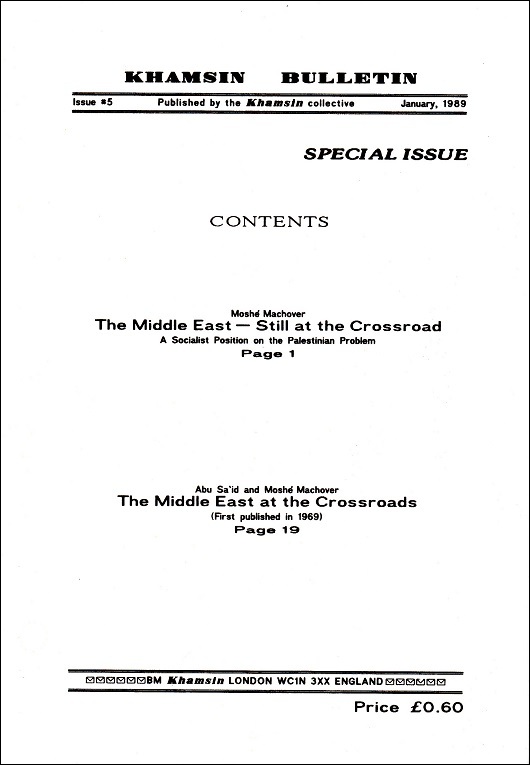 S. I wrote this paper about Palestinian strategy while I was an official representative of the PLO. That was about ten months ago and so far I am still an official representative. I signed this paper ‘Said Hammami, PLO representative’. If you represent an organization, then what you say should represent the organization. However, I am not a civil servant. We are not a bureaucratic organization with ambassadors and civil servants who just echo what is said in headquarters. I am also a member of the Palestine National Council (PNC), I am also a member of Fatah, and what I said in that paper had enough support within the PLO and Fatah to keep me in my position. If it did not have the support of a substantial majority, I could not have remained a PLO representative. It is true that it is not the official position of the PLO. The rejectionists’ policy is also not the official position of the PLO. But the difference is that the rejectionists have never had an official PLO representative expressing their views, while there are many PLO representatives who speak the way I do. I have the support of the majority of the Palestinians, the Democratic Front supports me, the great majority of Fatah supports me. I am very proud to say that when Chairman Arafat was asked about my paper, he said, ‘I read it and I think it is full of logic, full of logical proposals’. He was also asked whether this was official PLO policy. He said, ‘It is not, but it is full of logic’. What he meant is clear. In the next meeting of the Palestine National Council, I shall present my paper and propose it for official endorsement by the PNC, and I hope it will be endorsed. M. I have another difficult question. Let me first make it clear that we in Matzpen thoroughly denounce the cruel actions of the Israeli army, very often against civilians, including women and children ‒ indiscriminate bombing of civilian populations and of refugee camps, for instance. Having said this, I would like to ask what you think of such actions as the one carried out in Ma’alot, and similar incidents, in which the victims were civilians, especially children? I am not asking about the legitimacy of armed struggle, which is another issue. I am asking about the specific choice of civilian targets, especially children. S. Like you, I denounce the killing of civilians, especially children, women, and old people, whatever the circumstances. But I also believe that the Christian-like attitude of standing up to condemn terrorism and then sitting down with a clear conscience is as facile as it is futile. It means nothing. Without finding the roots of the conflict you cannot put an end to it. Terrorism is just a symptom of the real disease, which is aggression, which is Zionism, which is the destruction of Palestinian society, which is the creation of a state in the Middle East on the ruins of Palestinian society. If we do not start from this point, we will get nowhere. There is a conflict, there is a war, between us and the Israeli establishment; and in the course of this war many crimes have been committed. It is ironic to hear some Zionists talking about the Palestinians as terrorists, because terrorism was brought to the Middle East by the Zionists. Take a man like Yalin-Mor ‒ a terrorist. My friend Abdullah al-Hourani told me that during a conference in Paris, Yalin-Mor stood up and said: ‘I am a terrorist, and I killed civilians. I bombed, I burned, I shelled civilian targets, and I know very well that without terrorism there would not have been a state of Israel. You, the Palestinians, are now engaged in terrorism; it could be justified, but I want to tell you that politically it is not doing you any good, because it pushes the Israeli public into the arms of the establishment’. Many of the leaders of this present Israeli establishment are ex-terrorists, aren’t they? Perhaps all of them are: Allon and Rabin were in the Palmach, Begin was the leader of the lrgun, and so on. Under British law they were all terrorists. As for Ma’alot, the real criminal was Dayan, who misled the Israeli cabinet about the intentions of the Palestinians from the Democratic Front. He then gave the troops an order to start shooting, and the children were killed in the cross-fire. I don’t want this to be understood as if I am justifying terrorism. I cannot accept terrorism, not only for moral but also for political reasons. Because I am a progressive Palestinian, and I believe that if you kill Israelis indiscriminately, you are playing into the hands of the Zionist establishment. Our enemy is Zionism, not all the Israelis. But I want to say that if the Israeli public does not realize that in this state of conflict any one of their children might be killed, exactly as any one of the Palestinian children might be killed by the Israeli air force, if they don’t realize this and also grasp that this killing can be stopped only by a peaceful solution ‒ then terrorism will go on, and I am afraid that it might become worse. M. To conclude, I would like to raise another point. We in Matzpen have never regarded ourselves as working for a separate and isolated revolution inside Israel, but as part of the revolutionary forces of the entire region, of the whole Arab East. Our aim is the creation of a socialist union of the entire Arab East, a union in which all the non-Arab nationalities living in the region can participate, on a basis of equality and respect for their rights. For us, our support to all the just struggles of the region ‒ and most particularly to the fight being waged by the Palestinian Arab people for their national and social liberation ‒ is a matter not merely of abstract solidarity, but of close participation. In this respect, I would like to ask: what can the progressive and anti-chauvinist forces on both sides do? In particular, what can be done in a co-ordinated way, towards a common goal? S. Well, we don’t give lessons. I think the progressive organizations in Israel should themselves say what they can do. We can’t tell them. They know their society better than we do. We don’t believe in giving lessons or in taking them. But once we and they agree on basic and fundamental facts, we and they can be sure that we are going in the right direction. I think that they have a very great role to play. It takes a lot of courage for any Israeli Jew to stand up in Israel and say: ‘Look, fellow Israelis, you have got to withdraw, you have got to negotiate with the Palestinians, they must have their own state, and the state must be a first step towards the reunification of Israel-Palestine, of the whole country’. What can we do together? Well, they can help us in educating our masses and we can help them to educate their masses. We need to know more about Israeli society, and they need to know more about Palestinian society. We need to know more facts about the Israeli working class, about the future potential of that society, and they need to know similar facts about us. If it was not a crime under Israeli law, we would invite progressive anti-Zionist Israelis to come and participate with us in the PNC. We believe that the PLO, as an organization struggling for a united secular Palestine, should itself be a reflection in miniature of that envisaged society, and that is why we would invite all progressive anti-Zionist elements in Israel to come and participate in planning our policy. This might sound a bit optimistic. It is. But first we need to know more about each other. We need a continuous dialogue. Then we can cooperate in publicizing their literature among our masses, and they can publicize our literature among their masses. A lot can be done together, but first we need a common understanding. M. Thank you very much, Said. I hope that our discussion today may contribute to this understanding and this dialogue.